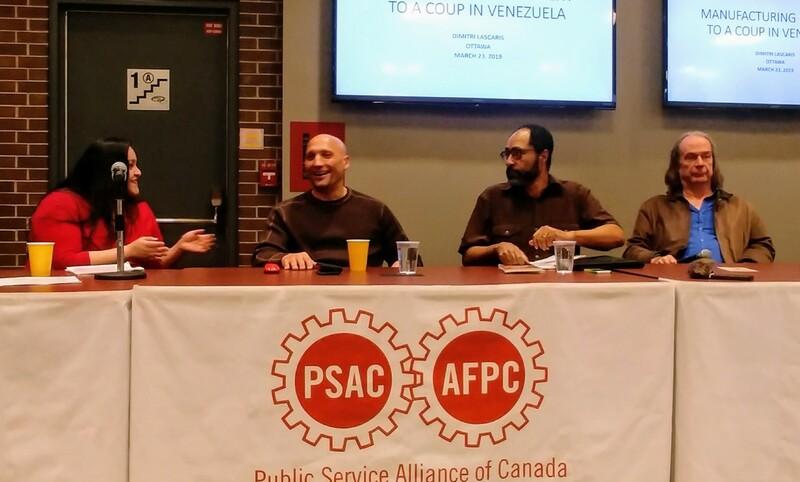 This Saturday, March 23rd, the group “Hand-off Venezuela” from Ottawa-Gatineau, with the support of the Public Service Alliance of Canada, organized a panel under the title “Manufacturing Consent to A Coup in Venezuela”. The panel was composed by the lawyer and journalist Dimitri Lascaris from Real News Network, Jean Saint-Vil, a Haitian-Canadian activist, and Laura Ávalos, a Canadian-Salvadorian who has been very active in the so-called “chavista” movement in Canada. 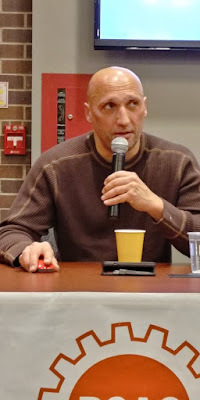 The panel was moderated by Peter (I could not record his family name), who is the leader of the “Hand-Off Venezuela” in the Ottawa-Gatineau region. The “star” of the event was Lascaris, who spent one week in Caracas from February 1st until the 8th. He acknowledged that he does not speak Spanish (he relied on a local fixer for the translation). He also said that he could not go to the shanty towns (the barrios) because of lack of security (the local fixer refused to go to the poor areas). He stayed at a four-star hotel in Altamira area, where all the international correspondents stayed. He claimed that he did not receive any payment from the Maduro regime, not even to cover his expenses to travel or while in Venezuela. He gave some background information about the country that was – at least from the point of view of any objective observer – very biased. For example, he presented two photos of the members of the National Assembly: one with the members of the ruling party PSUV, and another showing the representatives from the democratic opposition forces. He said that it was clear that the photo from the PSUV showed the “majority” of Venezuelans who are coloured and mestizos, while the picture from the opposition showed mainly white people (i.e. the “minority” of Venezuelans). Lascaris played the racial card many times during his presentation, implying always that the democratic movement against Chávez and Maduro was mainly composed of some kind of “white supremacists” trying to impose the interests of a minority to a large majority of coloured/mestizos/black Venezuelans. The Haitian-Canadian Saint-Vil played exactly the same card, repeating ad-nauseam during his presentation that “white Venezuelans” were trying to destroy the “legacy of Hugo Chávez” that empowered black Venezuelans and helped them to overcome poverty and marginalization. Coming back to Lascaris’ presentation, he repeated several of the lies of the Maduro propaganda: Guaidó is “self-proclaimed,”Maduro won a “fair election with 68% of the votes” in May 2018, the current economic crisis is mainly due to the “US embargo” and the fall of oil prices in the international market, that Venezuela has a wonderful constitution that protects the environment, the rights of the indigenous peoples, and all kinds of “chavista” fantasies. He attended a couple of demonstrations while in Caracas: one from the democratic forces in support of Guaidó, and another one in the Avenida Bolívar of those supporting Maduro. Lascaris said that he saw two peaceful demonstrations, that no police nor military blocked people of neither side, etc. He painted a picture of almost “Swiss order and peace”, forgetting to mention that the Maduro police and military killed 240 young men during the protests in 2017 and 2014, that they arrested more than 3000 people, almost 1000 civilians were the subject of “military trials” (something that is unconstitutional and violated their human rights). Lascaris claimed that he is an experienced journalist, but during his presentation, he showed lack of rigour and lack of basic journalistic skills. He said repeatedly that he was “not an expert in Venezuela,”but he did not do the basic job of a good journalist: check the facts about Venezuela, look at background information, do some research before going to the country, try to go beyond the stereotypical interviews and testimonials. He did not do anything that is required from a decent journalist. But he is not a journalist. He is a propagandist. That’s why he did not “know” about the killings of young opposition members in 2014 or 2017, he did not mention the killing of the Pemon people, he did not know that almost 4 million Venezuelans have fled the country because of poverty, diseases and starvation, he did not say a word about the destruction of the national oil company Pdvsa, or the massive corruption since Chávez was in power and continued under Maduro, and all the other facts that Lascaris did not find relevant during his short visit to Venezuela. Not even he mentioned, because he is not aware of it, I am sure, that union leaders from the government-owned corporations of Guayana in the south of Venezuela, have been murdered or jailed by the Maduro regime (and this panel was taking place in the building of a Canadian union and was supported by the public employees’ union). But I repeat: he is not a journalist, he is an agent of Maduro’s propaganda. Regarding the other two presentations there is not much to say. Monsieur Saint-Vil made a parallel analysis between the situation in Haiti under Jean-Bertrand Aristide and Maduro. He played the racial card, talking about “black Venezuelans” (who supported Chávez and supposedly now support Maduro) being exploited by the “white opposition” (it seems that this guy never saw a picture of Guaidó and other opposition leaders, but they don’t care about the facts). Laura Ávalos, who tried to be “objective”, was not very well informed about the history of Venezuela or even recent facts. For example, she did not know that Venezuelan democracy played a pivotal role in the peace negotiations in El Salvador through the Contadora group in the 90s (her family is from El Salvador). She did not know either that the current Canadian aid of $55 million is going to help the Venezuelan refuges in Brazil who are in the United Nations High Commissioner for Refugees (UNHCR) camps located in Boavista. But she claimed that she was “very well informed” about the crisis in Venezuela. OK, yes I “believed” Laura. Two additional comments about this particular event of lies about the crisis in Venezuela. First, the panel did not have any Venezuelan. They pretended to tell the “truth” about Venezuela without any Venezuelan in the panel. Fortunately, some Venezuelans were in the room to present the facts and debunk the lies of the panellists. Second, the racial card was played during the event until the extreme, including the hysterical position of some attendees who shout at me, because I have to “renounce to my white privilege” if I want to really understand what is happening in Venezuela. The person who came shouting at me with this “inverse racist” remark did not like that I responded to her in French (and she is French, according to her own confession). A truly surreal experience. A final note (more surreal). Don, a Canadian chavista activist, told me that he cannot believe at all that the “Cubans” have any influence in Venezuela, that they don’t control the military or have intelligence services in the country. That was the summit of craziness. That’s what ideology can do to your brain. Furthermore, one Chilean woman whose husband flanked Issac as an intimidating brute, asked to know the names of "all the dead ones in Venezuela"!!. I choked as at that moment I was very upset, and had reached out to her in Peace.She, like so many others there, was rude and arrogant. Fullof her own family wellness! I also noted Dimitri called everyone a 'White Supremacist' in his twitter account. I believe he needs some new adjectives to draw from. At some point someone shouted 'Liar' to Issac, the writer of this well written article,about all the people who have left our land and why, including ourselves. Dimitri vowed down to Chavez like the Witch sorcerer he appears to be. So not only is he a Chavez admirer, but I would not be surprised if his 1 week holiday in Venezuela was funded by the Maduro regime....There were far too many lies to count or go over. God help Canada and our future generationsfrom beasts like him....Oh that White Supremacist remark hailed at me as well, was but the most ignorant one yet. But far worse were all the lies about Guaidó and why he is a SELF PROCLAIMED false President. The race card of how badly blacks have been treated made me want to throw up, literally....And as Venezuelan I had to look deep into our History again, because of the way the Haitian older man spoke: as if our Venezuelan flag was 100 % their own creation and design.As if Haitians had hand-stiched and designed our Venezuelan Flag from scratch. Not so. Francisco Miranda designed it with inspiration from a German philosopher and writer Johann Wolfgang von Goethe.His original design was first flown on March 12, 1806 at Jacmel, Haiti as Miranda's expedition prepared to make the final leg of its voyage to Venezuela.This is the way I learned of it and this is the way that I will remember it, for a long as I live. No thanks are due to this panel of ignorant bodies. I fell bad for Laura, the one woman sitting among all these men who seemed to gobble her up live. She was ill prepared even with notes in front of her. What a waste of time witha bunch of ignorant people. Ignorance no doubt is the root of GREAT evil. Las mentiras no cabían en el salón. Me qudé atras porque tenia que irme antes de que treminara el evento y doy gracias a Dios porque de haberme quedado más tiempo, mi acompañante habría gritado con frases politicmente incorrectas y hasta le habría dado un puñetazo a lguien. El comunista, tipo colectivo venezolano que enfrentamos en el pasillo me quiso decir mentirosa y la lance a la cara que yo si soy venezolana y sé la verdad. Se volvió a meter en su recinto, no sin antes gritarle al recepcionista que no se dejara engañar por nosotros. La ira me estrujaba el estómago y la garganta la sentía seca como un cartón. Al enterarme por la reseña de Isaac, casi lamenté no haberme quedado. La Laura Avalos, es una comunista inmadura y no creo que sea Salvadoreña sino Chilena y viene de una familia Allendista. En ese recinto habia de todo color y se antojan de hablar de White supremacy cuando además estaban unos cuantos viejitos muy blacos que deben ser Canadienses pero que estaban gozando del relato comunista. Muchos de esos ignorantes cadienses comunistas viven en Rockclife. Tengo el disgusto de conocer algunos. Gracias Isaac y Teresa por cantarles la verdad a esos ignorantes. Desafortunadamente somos personas de otra categoría y tenemos que ser personas en lugar de sucios animales como los que insultaron a María Corina Machado asistidos por la Embajada de Venezuela que probablemente regaló los afiches con los que la representaban.... Cuerda de vendidos todos los que hacian vida alli y entiéndase, todos. Wow! Bien dicho Luisa, hermana venezoalana, a quien te tengo tanto respeto. Thank you Doug for sharing your comments and for reading my blog. Los Pendejos sin Fronteras de Maduro son una vaina seria. Al menos la mayoria de los chavistas de aca (menos los enchufados claro esta) la estan pagando su estupidez. Pero esa cuerda de idiotas que viven en paises desarrollados y tienen las agallas de pontificar sobre la situaction en Venezuela? Lo que dan ganas es de dejarlos sin un centavo ni traductores en Los Erasos o en la Bombilla y que la pasen chevere con la revolucion. Profesor en el Departamento de Comunicación en la Universidad de Ottawa (Canadá). Venezolano nacido en Tánger, Marruecos/Associate Professor and former Chair, Department of Communication, University of Ottawa.